The metropolis is seen here in this tapestry "Metropolitan Station". 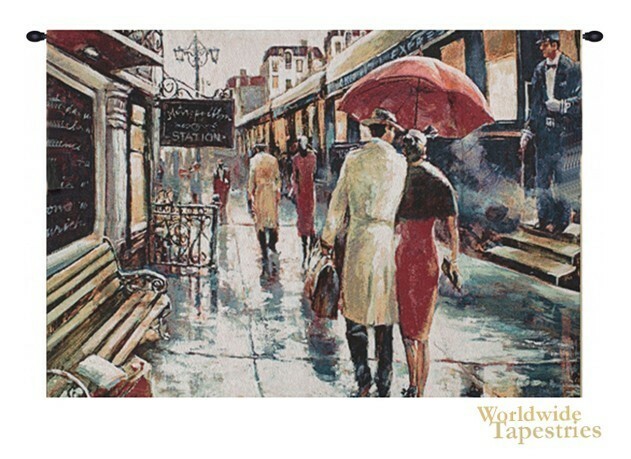 In this scene we are taken into the world of a romantic setting where a couple walks in the rain towards their train. This scene is reminiscent of the trains of Paris, France in a former era where train attenders wore tuxedos. The color palette is cohesive and is composed of warmer reds and beiges to contrast with the silvers and blacks of the cityscape itself. This cityscape tapestry "Metropolitan Station" is backed with a lining and has a tunnel for ease of hanging. Note: tapestry rod and tassels, where pictured, are purchased separately. Dimensions: W 53" x H 35"